British historian Hugh Thomas died May 6th, aged 85. The best of Thomas’s many books — which ranged from The Suez Affair (1967), An Unfinished History of the World (1979) and The Conquest of Mexico (1993) to three novels — treated ideologically controversial subjects with impartiality in a sparkling style. The Spanish Civil War, published in 1961, was the first objective general study of the subject. A clandestine bestseller in Franco’s Spain, it became a colossal success after the general’s death, and helped unite Spaniards around a single historical account. It thereby made an important contribution to “reconciliation”, as Madrid acknowledged this week. His 1,710 page Cuba: Or The Pursuit of Freedom (1998), with its wonderfully ambiguous sub-title, is equally indispensable. It locates the origin of Cuba’s turbulent modern history where it belongs: in 1762, with the English capture of Havana. John Paul Rathbone, “Lord Thomas of Swynnerton, historian and Hispanist, 1931-2017“, Financial Times, 13 May 2017 (metered paywall). Thomas was a member of the Labour Party until 1974, and sat as a Conservative in the House of Lords, before joining the Liberal Democrats in 1998. He is best known in the UK for his friendship with Margaret Thatcher. Posted in History | Comments Off on Hugh Thomas, R.I.P. Iván Acosta (born 1943) left Cuba in 1961 and settled in New York, where he now works as a playwright, filmmaker and publicist. Below are excerpts from statements Acosta made when interviewed on the subject of Amigos (1985), the first full-length film he completed as director and screenwriter. The film conveys the experience of Ramón, a fictional refugee who arrives in Miami by sea with the Mariel exodus. I happened to be in Miami when the Mariel exodus started. Early May 1980. …. Speaking with my friend Marcelino Miyares, who was the C.E.O. of WBBS Channel 60 in Chicago, I told him it would be great to film a documentary about the Mariel experience; Marcelino asked me, why not a movie instead? …. We created a company, … and [began] filming in July. It took us 8 weeks to film Amigos. We filmed 80% of the film in Miami; the rest was shot in South Carolina, Washington DC, Union City, New Jersey, and New York City. …. The Cuban community in Miami had a very negative attitude towards the new refugees. So, to me, it was very important to tell the human story of the Marielitos. …. I wrote the script as a bittersweet comedy drama. …. Of course, the Cuban ultra conservatives or extreme right of Miami … didn’t like some of the things said and denounced in Amigos. …. We all know Cuban machismo; I have seen it and experienced it all my life. You see, the revolution was the greatest promoter of machismo. All those bearded, sweaty, cigar smokers and trigger- happy militiamen impregnated the macho image—an image the maximum leader always projected and demanded among revolutionary militants. Hundreds of homosexuals were sent to prisons and to hard-labor concentrations camps, las UMAP, just for not being macho enough for revolutionary standards. Cubans, pro and anti Castro, somehow tried to imitate the Máximo Líder. I have always disliked the extreme machismo, not only among Cubans, but among all men …. We do know machismo exists, and in many societies it is celebrated and even rewarded. That was what happened in Cuba after 1959. The men wanted to be more manly than ever before, and that influence came with the exiles. I tried to ridicule the absurd machista behavior throughout different scenes in the movie. …. To me, machistas, racists, and homophobics go hand in hand. Unfortunately, that mentality exists among some Cubans, in exile and in the archipelago. …. I love Miami. I have never lived in Miami, although I visit it at least once a year. …. You see, I’ve lived all my 50 plus years in exile in New York City. They always say Cubans in New York think different than Cubans in Miami, even than Cubans across the Hudson River in New Jersey. It is true, Cuban New Yorkers think and have a different perspective of the Cuban situation in general. We always hear about “Cuban Success,” which is real for some, but we never hear about a majority of hard-working Cuban exiles: in factories, restaurants, mechanical shops, construction, farms, etc. Those represent the real Cuban exiles, the working men and women who, in several cases, risked their lives to escape from Cuba to live and work in freedom. But some people consider successful those who accumulated several millions of dollars and have a luxurious yacht, a big mansion with 5 or 6 expensive automobiles. In Amigos, I tried to show that balance without criticism, the gap between the Cubans who have a lot and the unsung heroes who built the Cuban Miami and don’t have as much. “AMIGOS and Miami Post-Mariel“, Carolina Caballero talks to director IVAN ACOSTA, Cuba Counterpoints, 1 August 2016. Carolina Caballero was born in the United States to Cuban parents. She lectures in the Department of Spanish and Portuguese, at Tulane University in New Orleans. The questions she asks Mr Acosta, more of his answers, and stills from the film Amigos, can be downloaded at the link above. FT journalist Cardiff Garcia has written a long blog on Cuba’s troubled economy and the dilemma its leaders face in negotiating removal of the US embargo. The Cuban state still directly controls most of the economy and employs the majority of the population: between about 60-75 per cent of the workforce, depending on how you account for off-the-books second jobs and participation in the limited private sector. State salaries are abysmally low, roughly the equivalent of $25 USD per month by official figures. In real terms, wages have never recovered from their collapse when Soviet subsidies to Cuba ended more than twenty-five years ago. Pensioners such as my 89-year-old great aunt Juana receive the equivalent of $8 USD a month and a few supplemental items from what is left of the “libreta”, or ration book. Billions of dollars in remittances from relatives in Florida and elsewhere remain crucial to the economy. Healthcare and education are free but under-resourced, offering little meaningful choice. The country’s ossified economy and terrible demographic trends — a consequence both of very weak fertility for a developing country and emigration — long ago started pressuring the government’s ability to fund them. Cardiff Garcia, “The US and Cuba: incrementalism, reversal risk and the Dictator’s Dilemma“, FT Alphaville blog, 21 March 2016 (free access; one-time registration required). “The existence of a flexible second economy (providing employment and efficient production) within the official planned economy provides state socialism with a very convenient, short-term subsidy, even if its long-term impact can be quite corrosive. “Furthermore, this subsidy is provided through the active self-exploitation of a large part of the workforce (working in a state job as an air-traffic controller by day, while moonlighting as a clandestine airport cabbie by night, for example). “The outright prohibition of activities the government prefers to keep under state monopoly (such as the import-export business and most professions) allows it to exercise symbolic control over the population and impose an apparent order over Cuban citizens and society. “However, this control comes at the cost of pushing all targeted economic activity (along with potential tax revenue) back into the black market—where much of it lived prior to 2010 as evidenced by the high proportion of [cuentapropistas, or private businesses] who are found in government surveys to have been “laboralmente desvinculado” (unconnected to the state sector) prior to becoming legally self-employed. “On the other hand, the inclusion and regulation of the many private activities dreamed up and market-tested by Cuba’s always inventive entrepreneurial sector would create more legal employment opportunities, a higher quality and variety of goods and services at lower prices, while also increasing tax revenue to target inequality and fund social programs. “However, these benefits come at the political cost of allowing greater citizen autonomy, wealth and property in private hands, and open competition against long-protected state monopolies (Celaya 2013a and 2013b). “Calling attention to the unique institutions of state socialism and tracing the linkages between state agents and private entrepreneurs affords us an insider’s view of the corrosive effect of the second economy on state socialism. “Such an approach also reveals a major historic instance of what Max Weber called “unintended consequences”: the party-state’s instrumental, if inadvertent role in its own demise. Mr Garcia describes the Ritter/Henken volume from which he quotes as “probably the best available book on the evolution of the modern Cuban economy”. Cardiff Garcia, “Alphachat: the Cuban economy, and Caroline Freund on emerging-market billionaires“, 25 March 2016. Alphachat is available without charge at the link above, and on Acast, iTunes, or Stitcher. Cuban dissidents, Arizona and Hamilton! This is my recommended podcast of the week. The one-hour show begins with an interview of the Cuban journalist Miriam Leiva, widow of economist Oscar Espinosa (1940-2013). If you don’t listen to anything else, don’t miss this part. The next segment is a follow-up of an FT column on Arizona’s increasingly warm welcome of visitors from Mexico. The third and final segment is a review of the Broadway musical “Hamilton!”. FT blogs and podcasts are not metered – downloads do not count against limits imposed on those without subscriptions to FT — but free registration is required. Here is a guide to each segment of this week’s Alphachat. Taped in Havana, Cuba, I spoke with the Cuban journalist and dissident Miriam Leiva about the life of her late husband, Oscar Espinosa Chepe. He was an economist with an irrepressible instinct to tell the truth to a regime that didn’t much want to hear it, and he was repeatedly punished for it throughout his life. In 2003, Chepe was one of 75 Cubans arrested and given long prison sentences in what is known as the Black Spring. Already suffering from liver disease, he was interrogated and treated brutally. When finally released on health grounds after eighteen months, he went right back to telling the truth. I loved this interview more than any other I hosted in 2015. You might have heard that the US is yet again having a heated national debate on immigration, especially now that the race for the Republican nomination is well underway. But the FT’s national US editor Gary Silverman traveled to Arizona, where Mexicans can [enter the state with a border-crossing card] …. We play some interviews from Gary’s trip and then talk to him in the studio. Shannon and I gush about the hip-hop Broadway musical that depicts the life of US founding father Alexander Hamilton, the country’s first Treasury secretary who was killed in a duel by Vice President Aaron Burr. Cardiff Garcia, “Alphachat: the life of a dissident Cuban economist; a Mexico-US free travel zone; ‘Hamilton’!“, FT Alphaville podcast, 19 December 2015. Posted in Uncategorized | Comments Off on Cuban dissidents, Arizona and Hamilton! Many homes in Cuba have computers, but few are connected to the internet. Private entrepreneurs have seized this opportunity to deliver internet content to customers each week on a memory stick known as “el Paquete” (the Package). The Paquete is an alternative to the web in a country where, according to some estimates, fewer than 5% of homes are connected. It consists of a terabyte of data bringing together the latest music, Hollywood movies, TV series, mobile phone apps, magazines and even a classifieds section similar to Gumtree or Craigslist. …. It’s all carried out outside any legal framework in Cuba – and with seemingly little regard for international copyright law. …. Ana [Lauren, a 24 year-old journalist from Havana,] … says she looks forward to Mondays when the latest edition of the Paquete is delivered to her door. …. “I can copy whatever I want. …. She adds that she pays between one and two US dollars for the Paquete each week, depending on how much she chooses to copy to her computer. Emilio San Pedro, “Cuban internet delivered weekly by hand“, BBC News, 10 August 2015. What surprises me most is not the ingenuity of Cuban entrepreneurs, but the fact that government tolerates their activity. This is a sign that the country is becoming more open. 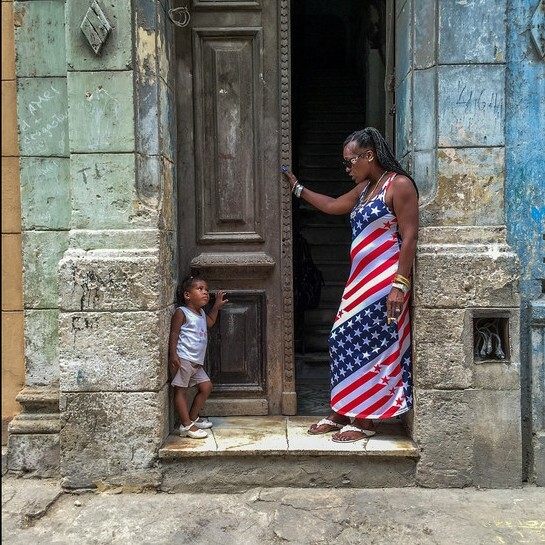 Old Havana at the beginning of a new era. Matthew Garrahan, “Vice goes to Cuba“, Financial Times, 16 May 2015 (metered paywall). Excellent column, with many photos. US investors will soon learn what Canadian and European businessmen have long known: doing business in Cuba is not easy. Cuba is still a foreign land for international business. Features of the revolution endure to this day; rudimentary use of the internet is only the most visible. Statistics are produced by the state and there is no independent verification. Foreign exchange reserves are never published. Military-controlled companies retain almost all the hard currency Cuba earns. State employees — estimated at more than 70 per cent of working-age Cubans — receive an average of less than [US]$30 a month in currency worthless anywhere else. “They pretend to pay us and we pretend to work” is a joke almost as old as Havana’s Cadillac Eldorados. Foreign investors and embassies, forbidden by law to select their own employees, pay well above state rates, producing absurd results: at the British embassy, I had a PhD in microbiology working as a nightwatchman. Education matters little when you cannot pay your bills. Paul Webster Hare, “Dangers in economy run by Cuba’s revolutionary in a business suit“, Financial Times, 12 May 2015. The writer served in the British diplomatic service for 30 years and was British ambassador to Cuba from 2001 to 2004. He now teaches classes on Diplomacy and on Cuba in Transition at Boston University. The renewal of diplomatic relations between Cuba and the United States brings an expectation of greater integration of the island’s economy with the outside world. Ms Nagy, from the European Bank for Reconstruction and Development, explains how Cuba can avoid mistakes made during eastern Europe’s earlier transition to a market economy. One lesson that the international community learnt late was the key role that is to be played by reformed public authorities and the state in helping to define and anchor the reforms that support the market reforms. In the early post-communism euphoria the mantra of “State=Bad – Market=Good” dominated, leading to some of the worst examples of unfettered capitalism and wild-west economics that enriched the few and impoverished the many. It was only much later that the reformed state was recognised as being a key element in the transition process, removing itself where markets can do the job more effectively but remaining or even being strengthened where it can support an environment within which the free market can flourish fairly. It is important to bear in mind that simply destroying the state instead of reforming and adapting it to support market development and perform the provision of public goods can lead to chaos and the state’s eventual resurrection with autocratic features. Piroska Mohácsi Nagy, “Guest post: Venceremos! Cuba’s lessons from eastern Europe“, BBeyond Brics blog, Financial Times, 30 December 2014 (free access; registration required). For three more lessons, click on the link above. Downloads from FT blogs do not count against the monthly quota of free downloads for non-subscribers who register with the FT.